I've had a jar of molasses in the cupboard for a while, and I've spent that time trawling for suitable recipes and excuses to bake with it. It's taken a few months to get it into this gingerbread layer cake, baked to share with our cat-sitter and friend, Tash. The recipe comes from Smitten Kitchen - I know that Deb Perelman is a bit of a perfectionist with her recipes, and I like that she takes understated, realistic food photos in her own small home kitchen. (They're still a good deal prettier than mine, I know.) I trust her to bake a good cake. In fact, I think I just entrusted her with baking my first layer cake. The batter was pretty well-behaved; with oil and not butter for the fat, it didn't even need creaming with an electric beater. It just called for a bit of patience as I baked and cooled the three layers, one at a time, late on a Monday night. I whipped up the mascarpone cream on Wednesday morning and stacked up my cake with care, ignoring Perelman's cranberry garnish entirely. For a vegan version, I'd recommend replacing the eggs with ground flax seeds in the cake batter. I'm not sure how best to replicate the whipped dairy cream, but I reckon coconut cream or yoghurt is the best bet. Here the cake and cream have a surprisingly light texture. With a cup of molasses, a cup of brown sugar and a cup of white sugar in the cake batter, it's as sweet as Kimmy Schmidt. It's also got Kimmy's brutal aftertaste, a heated, malty mix of molasses, stout and ginger that depends on the triple-layered whipped cream to remain palatable. A small slice goes a very long way (and here it differs from Unbreakable Kimmy Schmidt, because I polished that off in just a few days). Place the stout and molasses in a large saucepan and bring them to the boil. Turn off the heat and whisk in the bicarb soda - the mixture will froth up but hopefully be contained by your large saucepan. Allow the mixture to cool to room temperature. Preheat an oven to 180°C. Trace and cut out three pieces of baking paper to fit the base of a springform cake tin. Line the tin with just one of them, and lightly spray the tin inside with oil. Place the sugars in a large bowl and whisk in the oil. Whisk in the eggs, one at a time, until smooth. Whisk in the cooled stout-molasses mixture until smooth. Sift over the remaining cake ingredients, and stir them into the batter until just combined. Pour one third of the cake batter into the tin and bake it until it passes the skewer test, about 20 minutes. Allow it to rest in the tin for 5 minutes before gently turning the cake onto a cooling rack. Repeat twice more with the remaining cake batter to form three cake layers. To make the mascarpone cream, pour the cream into a large bowl and sift over the icing sugar. Whip the cream with an electric beater until soft peaks form. Add the mascarpone and whip it into the cream until well combined. To assemble the cake, carefully transfer one cake layer to a serving plate. Pour a generous cup of the mascarpone cream onto the centre of the cake, spreading it out but leaving about an inch cake border. Transfer a second cake layer onto the top; its weight will push the cream out towards the edge. Repeat the process with another generous cup of cream and the final cake layer. Make the top layer of cream thick and wavy and spread it right to the edge of the cake. Refrigerate the cake for at least an hour before slicing and serving, with any extra mascarpone cream on the side. 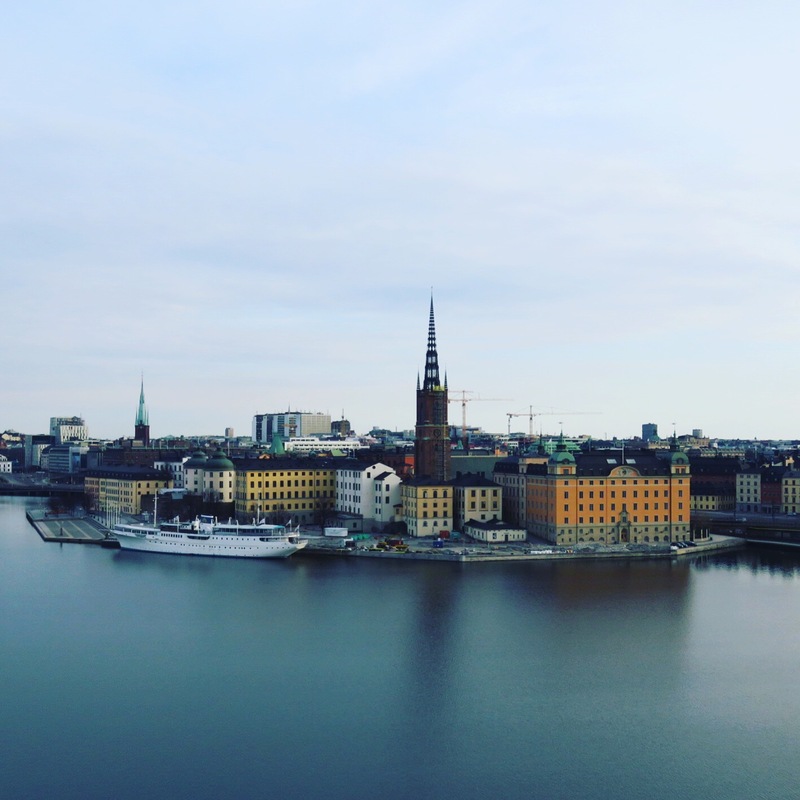 I'm spending a couple of months in Stockholm for work - a good excuse to add another country to our restaurant review map. Most of my meals out so far have been lunches, with work colleagues picking out some highlights around the centre of town and me doing a bit of weekend exploring further afield. 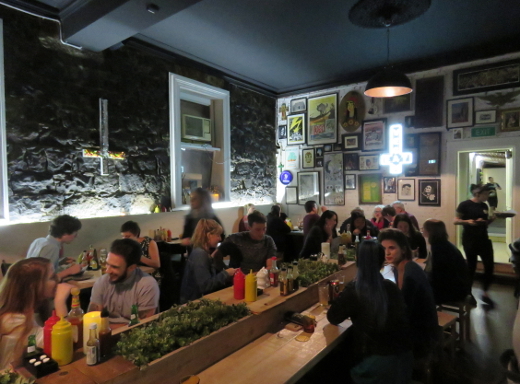 The food scene seems very veg-friendly - everywhere I've gone has had prominent vego/vegan options, and there are a decent number of totally vegetarian places. I had my first meal of the trip at Hermitage (Stora Nygatan 11, Gamla Stan), a vego restaurant that Cindy and I visited way back in 2006. Its buffet-style lunch of old-fashioned vego food powered me up for a big day of walking, with a mock-meat and chickpea stew, a big chunk of vegetarian lasagne, potato salad, bread, rice and some hummus. 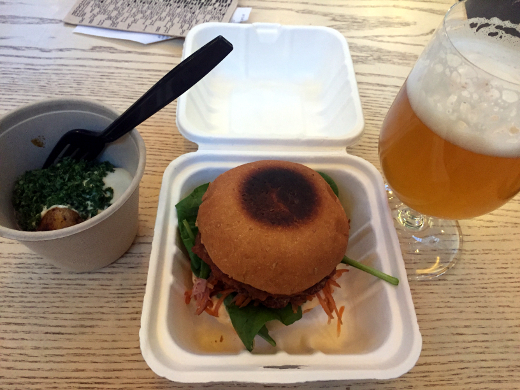 For 120kr (~$20) with a coffee, this is pretty decent value for money as far as Stockholm lunches go. I went back for seconds to make sure I really got my money's worth. 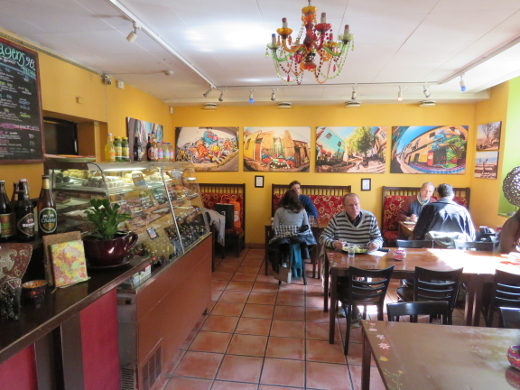 On Sunday I met up with a friend for lunch at the nearby Chutney (Katarina Bangata, Södermalm) a place I visited on my last trip. They do a 98kr lunch set, with a choice of four dishes plus salads, bread and coffee. My nasi goreng was excellent, with a rich peanutty sauce accompanying it and a few tasty chunks of mock meat to mix up the texture. This is right around the corner from where I'm staying, so it's going to get some more visits. I started work on Monday and quickly fell into a lunch routine with colleagues - they go out every day and have a strong selection of local options. 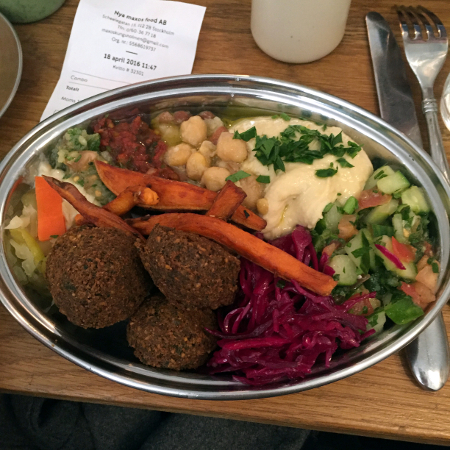 First up was Maxos (Scheelegatan 13, Kungsholmen), probably my favourite place so far - it's basically a felafel bar, but the vibe is a bit nicer than that implies and the food they serve up is brilliant. I had the combo (95kr), which is the best way to sample all the great salads and sides on offer with the felafel. 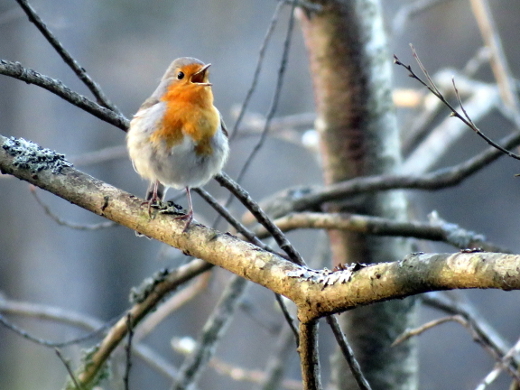 After work on Wednesday I went for a birding walk in a nature reserve near where I'm staying, turning up some decent birds and stunning natural scenery. 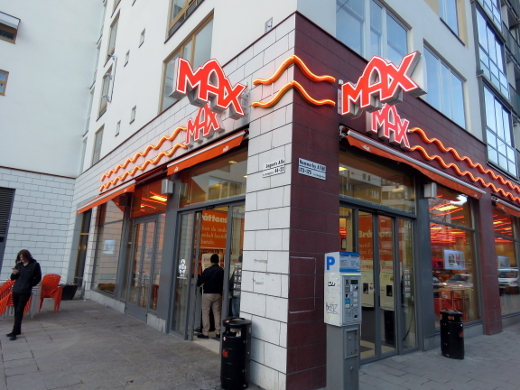 I stumbled out of the forest starving and stumbled straight into Max, a burger chain (I went to the one at Lugnets Alle 22, Hammarbyhöjden), to see if they could feed me. Amazingly, there were tons of options, with the highlight being the vegan bbq sandwich (based on Oumph!, a Swedish mock-meat). 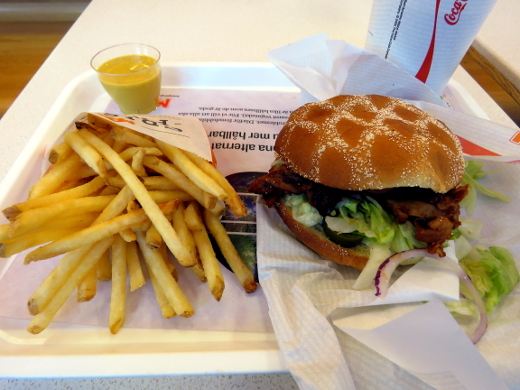 For 75kr (~$12) I got an excellent burger, some so-so fries and a coke. There's nothing fancy about this place, but it's super convenient and impressively veg-friendly. Another lunch highlight was Minh Mat (Odengatan 94, Vasaparken) a popular Vietnamese joint. 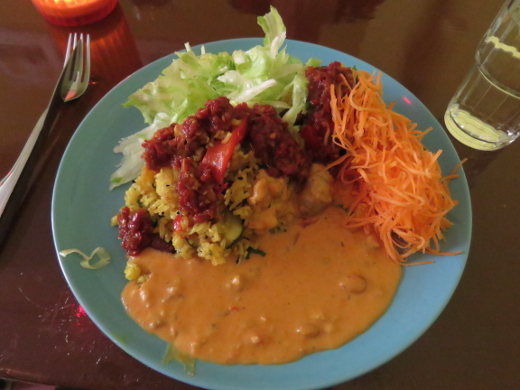 They do a limited lunch menu of three dishes per day, with at least one vegan option. 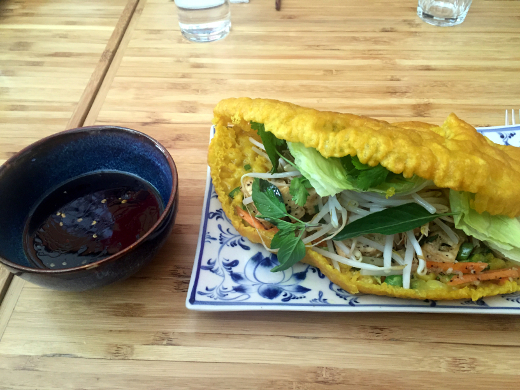 Thursday is banh xeo day, and the vego version didn't disappoint - chunks of tofu and fragrant salad in a crispy-fried rice batter pancake shell. The final meal of my first week was at the nearby Ringen shopping centre, in the recently opened upmarket food court. There are street food stalls from lots of famous restauranteurs, including The Plant (inside Ringen, Götgatan 132, Södermalm), supposedly Sweden's first vegan fast-food place. I tried the Hammer Burger, with a pulled-mushroom based pattie, chilli mayo, pickles, and a side of mini boiled potatoes with impossibly creamy mayo (115kr [~$18] or 145kr [~$23] with a beer). This was really impressive - it's another option very close to my apartment, so it's sure to feature again in the coming weeks. I'm really enjoying exploring Stockholm - there's tons of good veggie food and the city itself is stunningly beautiful (especially when the sun comes out). I'll post semi-regular food round-ups here, but anyone interested in more of the scenery/bird life should head on over to my instagram page. We're regular Smith & Daughters visitors and, as you can see up top, this is our seventh blog post about the restaurant. Yet our last post is from more than a year ago! Here's a run-down of the current, very-limited-time-only 2nd birthday menu. The weekend brunch menu takes its inspiration from American diner food, and with the help of Nat & Ben we were well across it. 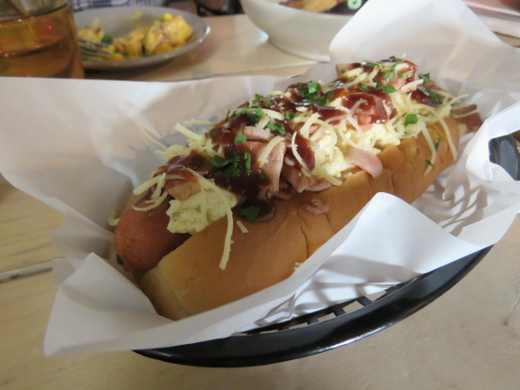 Michael was drawn in by the Brekkie Hot Dog ($15), piled up with tofu scramble, cheese, onion, bacon and BBQ sauce. It's an excellent vegan hot dog, to be sure, but one that taught me I'm not up to weiners and BBQ sauce this early in the day. 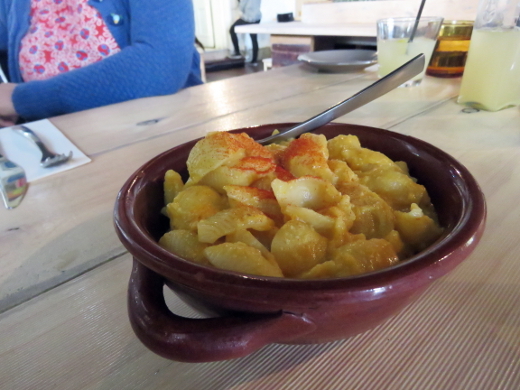 Nat was most enamoured with the mac n cheese ($14), carby and creamy and garnished with just a sprinkle of paprika. 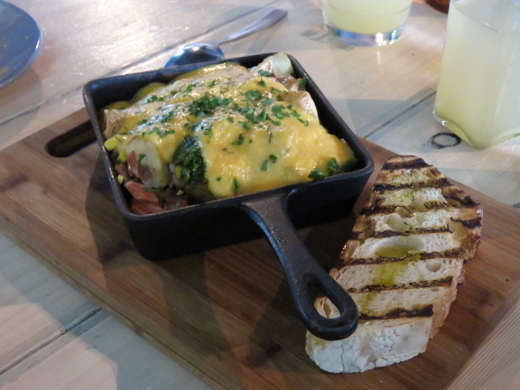 My surprise highlight was the hash ($16). The jalapenos and avocado of their long-standing Mexican hash are replaced here with bacon, onion and kale; the same corn, cheese sauce and starchy foundation of fried potatoes stuck around. How did that hash outperform the sweet stuff? There were two very, very promising contenders there. 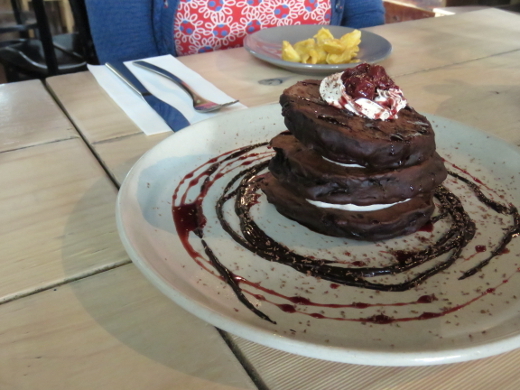 The first was this Black Forest Pancake Stack ($17). The pancakes had a lovely fluffy texture but weren't as chocolatey as they looked, although the garnishing ring of sauce fixed that right up. Two short days later we headed back in with Steph & Hayley for dinner. This menu is a greatest hits tour through Shannon Martinez's years cheffing around Melbourne at the East Brunswick Club, Gasometer Hotel, South & Sweetwater Inn (uh, yeah, we're fans). 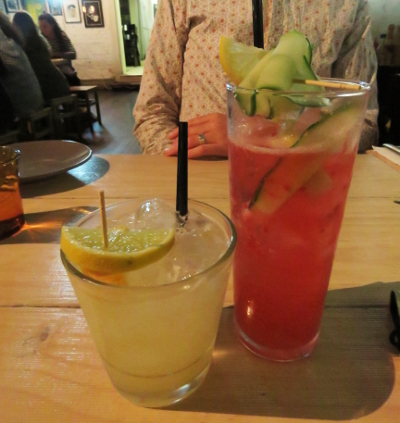 We kicked off with cocktails - a gin-spiked raspberry lemonade/peach sweet iced tea Arnold Palmer ($17) for Michael, and a potently citrussy Sour Puss ($17) for me. Our nostalgia was drawn in too many directions and it was tough to choose just two stomachs worth of food. 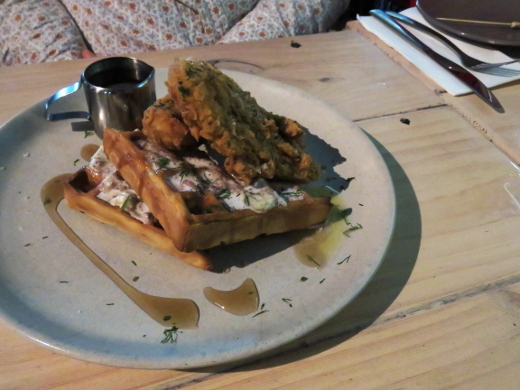 Michael and I started by halving the Gasometer-era Southern Fried Chicken & Waffles ($19). They were mercifully smaller but even tastier than I remembered, with the waffles slathered in caramelised maple bacon butter and a deceptively light spiced batter on the mock chicken. 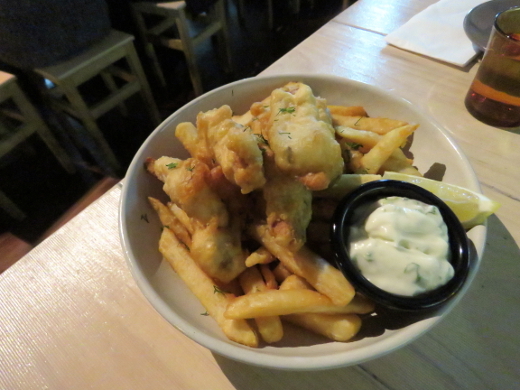 The Sweetwater Inn-style Fish & Chips ($16) was, by comparison, enormous. The mock fish, too, might've been flakier and more delicately beer-battered than in their first incarnation; the chips were very good, but not quite Gasometer-good. 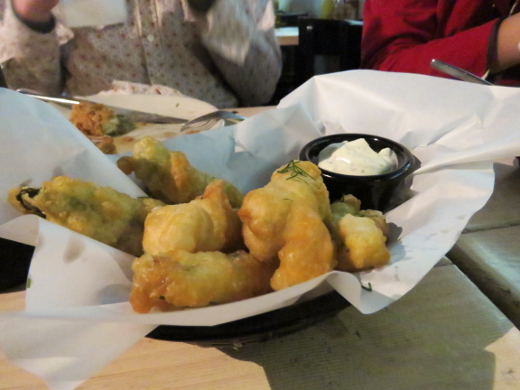 By this time I was ill-equipped to take on the Gasometer-throwback Crispy Fried Pickles ($10) that Michael insisted on. They would've been at their best with that Sour Puss cocktail and without the two major meals in between, interfering. Though we were really very full, I convinced my co-diners that one dessert between the four of us wasn't really a big commitment at all. 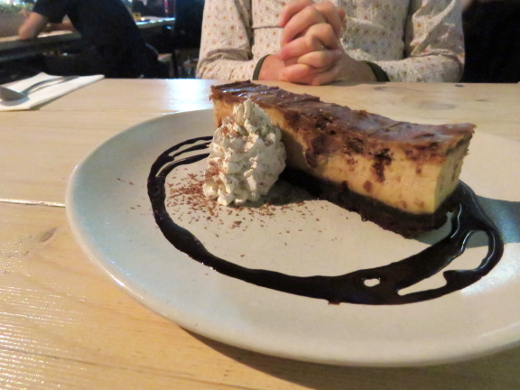 We revisited the East Brunswick Club's Choc Peanut Butter Cheesecake ($15). In 2009 I described it as 'a super-rich slab of salty-sweet heaven, best shared with a fellow connoisseur'. It still is. Smith & Daughters' 2nd birthday menu is an over-the-top celebration of a very special vegan restaurant, and the chef behind it. They've just announced an upcoming cookbook, and we can't wait to see what they dream up next. You also can read about one, two, three, four, five, six of our previous visits to Smith & Daughters. 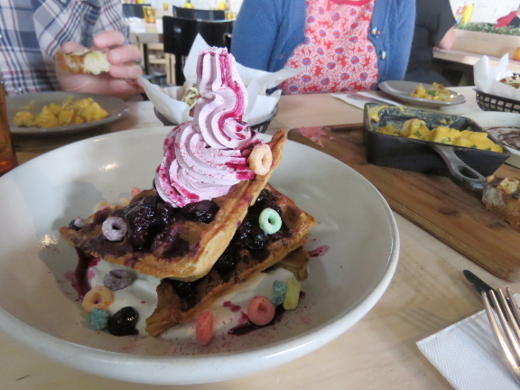 The flash-back faves menu has also appeared on A Melbourne Vegan Eats. Since our last blog post, Smith & Daughters has received positive coverage on veg blogs Vegetarian Life Australia, Veganeers, Veganopoulous and Vegan Miam. It's also won fans on omni blogs Filled with Food, The Melbourne Fussy Eater, The Melbourne Glutton, DAMMIT JANET I LOVE FOOD, Sweet and Sour Fork, Cup of Three and Food Fable. Only Zinc Moon has had a tough time, seemingly due to a food allergy. Accessibility: The entry is flat and narrow and the tables are pretty crowded. The interior is dimly lit and loud at night. Toilets were located up several steps, were gendered and of standard dimension. We ordered at the table and paid at a high counter. We were overdue for a home-cooked meal in general, a healthy one in particular and, I thought, another go at the Community cookbook. Once I saw the recipe for roasted pear (in season!) and gorgonzola (delicious year-round!) salad I didn't look any further. A look in the cupboard and the shops took me a little off recipe. I added a whole head of cauliflower to the recipe for some extra golden-edged substance. Most of the pears in our neighbourhood were rock-hard and not ready for dinner, but Michael found a few nashi pears at Pachamama that were worth a shot. The white wine (not white balsamic) vinegar and black lentils in the pantry would surely do the job. Sage leaves were plentiful but didn't fry to a crisp as they were supposed to. The ingredient proportions didn't quite add up (too, too many lentils and not quite enough dressing) but it was easy to portion out our own plates and make plans for the leftovers later. The salad was everything I had anticipated - layers of savoury, earthy green and brown with episodes of pungency and sweetness. Place the lentils in a saucepan and cover them with water. Bring them to the boil, then simmer them until tender (this can take 15-40 minutes depending on the type). Chop the cauliflower into bite-sized florets and place them in a baking tray. Drizzle over 2 tablespoons of olive oil, sprinkle over salt and pepper. Bake the cauliflower until tender, and golden around the edges, about 25 minutes. While the cauliflower is baking, slice the pear into 4-8 pieces each and remove the cores. Place the pear wedges in a baking tray. Drizzle over 2 tablespoons olive oil, the vinegar and sugar. Bake the pears until cooked through but still holding their shape, about 20 minutes. Melt the butter in a frying pan until it's frothing and add the sage leaves. Fry the leaves until they're crispy, then turn off the heat. Now it's time to assemble everything! 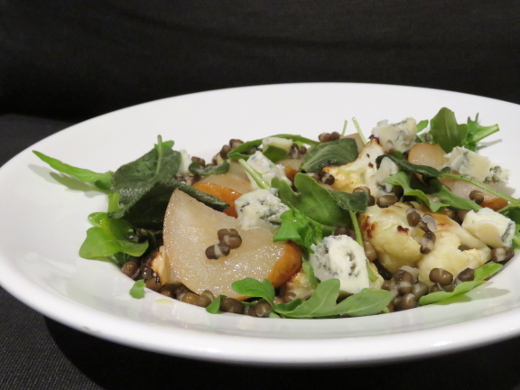 Layer up the rocket, cauliflower and pears (including the pears' roasting juices). Drain the lentils and spoon them over the top. Crumble over the gorgonzola and sprinkle on the sage leaves (and any still-melted butter in the pan). 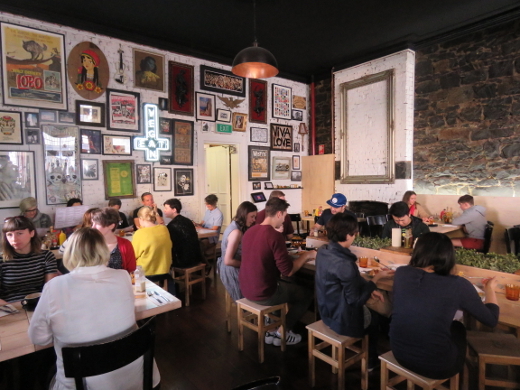 Fo Guang Yuan Art Gallery is one of the two biggest oversights highlighted in our Cheap Eats project spreadsheet - it's a vegetarian eatery that's been open the entire decade we've lived in Melbourne, yet we've never visited and blogged it until now. I put this down to the dining hall's opening hours, which are restricted to weekday lunch times and therefore quite inaccessible to us non-city workers. My workplace issued me with an Easter Tuesday off this year, and I used it to sneak in and give the gallery tea house a go at long last. It was quiet, almost hushed, and I had no trouble getting a four-seated table to myself. The menu is much longer than I'd expect for such an unassuming operation. The appetisers alone run to twenty mostly deep-fried options, and then there are several dozen more stir-fries, tossed noodles, noodles and noddle soups. Most dishes involve mock meat, with a few centred around tofu or mushrooms instead. Each day of the week has its own set of three bento specials, and there's a range of hot and cold teas. I enjoyed an iced kumquat tea ($4), which had the syrupy sweetness of cordial and a contrasting pithy aftertaste. At my late arrival time, two of the Tuesday bento choices were sold out; I didn't mind ordering the remaining nasi lemak ($12). It arrived quite swiftly and contained (clockwise from top left): lots of tangy pickled vegetables; a spicy mock beef rendang with potatoes, carrot and generous gravy; firm tofu with a chilli dipping sauce; steamed rice, mock anchovies, cashews and diced cucumber. It was all fun to graze on, and I was especially delighted to see the mushroom-based mock anchovies that we first discovered at Vincent last year. This eatery's reputation has waxed and waned over the years. I don't think it serves the best mock meat in Melbourne, but my bento box was pleasant, varied and very reasonably priced. The venue's greatest appeal is as a quiet, comfortable respite from the bustling city workday outside. 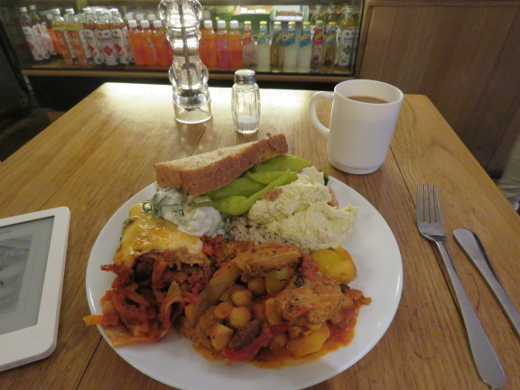 Most veg bloggers are very fond of this tea house, see praise on Veganopoulous (twice), vegan bullsh*t, easy as vegan pie, Nouveau Potato, and two contrasting posts on Miss T: Princess Vegan. Omni bloggers seem to have always been divided, with I Am Famished, New International Students, The Hungry Grub, Eat & Be Merry, Chomp And Slurp, Edible Posts, Confessions of an Eco-Food Dude, melbourne gastronome and We Do Chew Our Food in favour, MEL: HOT OR NOT against, and Mon's Adventure, Consider the Sauce and Ms I-Hua having mixed experiences. Acessibility: The entry from the street is wide and includes about ten stairs (and I didn't see an alternative approach). The floor inside is flat, tables are low and chairs have backs, with furniture well-spaced. I ordered at the table and paid at a high counter, and didn't visit the toilets. I was up for a cooking project on the Easter weekend, and the Serious Eats website was a good place to find one. Their columnist J. Kenji López-Alt is quite the experimentalist, and concentrates on vegan recipes for a month each year. He's inspired us to make icecream, soup and deep-fried cauliflower (and similarly driven our friend Stu to make and share a spectacular layered queso dip). 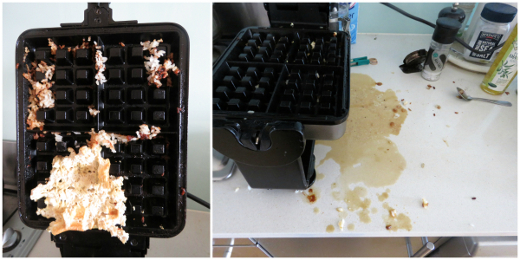 All this is just a wind-up and justification for the title of this post: I tried putting tofu and rice in my waffle iron because Serious Eats said it was cool. Both the article's comments and common sense told me that this could get messy, and it did. My waffle iron has a handle for making a 180° flip during cooking, and that was all my tofu needed to spill marinade everywhere. It's also got deep grooves, which are great for crispy high-surface-area waffles and getting batter stuck when the iron's not sufficiently greased... I should have paid more attention to that between batches. Still, I managed to retrieve most of what I waffled with some careful spatula and fork work. Firm tofu ends up looking very waffley indeed, although the crisp outer didn't elevate the tofu beyond a good shallow-fry, in my opinion. The pre-cooked sushi rice was both more infuriating and more enlightening - it's tough get it out of the iron without the squished rice patty completely disintegrating, but the crunchy golden edges are chewy and caramelised, like the rice in the bottom of good bibimbap. I garnished my waffled lunch with a slosh of kecap manis, a shake of shichimi togarashi and some steamed beans dressed in the leftover tofu miso marinade. I'm not sure if I'll waffle tofu or rice again but it was a worthy project for a nothing-to-do day where I was free to play around, make a mess, swear a bunch and eventually eat at my leisure. I've clearly been dominating the dessert division at our Ottolenghi get-togethers, because I felt a teensy bit flummoxed at the prospect of making a main. I lounged around with Plenty and Plenty More and some little ripped bookmarks, looking out for picnic-friendly autumn-appropriate dishes. I had plenty of time to plan and shop and cook. Michael nudged me into making the Very Full Tart - it looked like a ripper centrepiece and unlikely to be any the worse for being served at air temperature. Ottolenghi recipes are notoriously effortful, and this is the rare one where you can actually bring extra work upon yourself. In Plenty, the recipe simply demands that you procure 300g of shortcrust pastry. Welp, I made my own. With a food processor on hand it's not too much of a drag, and I called on this ol' pumpkin tart recipe for (butter-heavy) quantities. From there it was a long, slow procession of chopping and roasting vegetables - capsicums in two colours, eggplant, sweet potato, zucchini and onions. Layered up in the tart crust, they're topped with feta, ricotta and cherry tomatoes; thyme, too, if you can remember it. (Not me.) It's all bound together with eggs and cream. Though 45 minutes is theoretically enough to set the eggs, I found that the vegetables (especially the tomatoes) gave off extra juices and the tart was very bubbly. Cooled down and cut up in the park, it wasn't as quiche-y as I expected. True to its name, vegetables tumbled all over, coated in a creamy gravy and not a set custard. Everything felt on the brink of collapse, yet each vegetable and cheese chunk held its own, and their pastry casing stayed crisp. If you're not self-consciously saving a piece for photos, it's a dish you can make a wild mess of, safe in the knowledge that it'll still taste great. Place the flour and salt in a food processor. Roughly dice the butter and drop it in too. Blend the mixture together until the butter is thoroughly mixed through. With the motor still running, slowly pour the water in one tablespoon at a time, until the mixture comes together as a dough (you might not need all of the water). Turn the dough onto a large sheet of plastic wrap. Place another large piece of wrap on top. Roll the pastry out to fit a pie dish. Put the top wrap off and ease the pastry into the dish; remove the second piece of wrap and trim the pastry to fit the dish. Dot the base of the crust with holes using a fork. Line the crust with baking paper and dried legumes, or another pie weight of your choice. Bake the crust for 10 minutes, then remove the pie weights and bake the crust for a further 10 minutes. Allow the crust to cool. Turn the oven up to 220°C. Use a small knife to remove the stalks from the capsicums, and any membranes you can reach. Shake out any seeds still inside the capsicums. Place the capsicums on a small baking tray, drizzle them with a little of the olive oil, and bake them on the top shelf of the oven. Dice the eggplant into 3cm cubes and place it all into a large baking tray. Stir through about 4 tablespoons of the olive oil and some salt and pepper. Bake the eggplant for 12 minutes. Peel the sweet potato, dice it into 2cm cubes, and add it to the eggplant when it's done. Bake them together for a further 12 minutes. Halve the zucchini lengthways and slice it into 3cm lengths. Add it to the eggplant and sweet potato pieces when they're done, and roast all three vegetables together for a final 12 minutes. By now the capsicums should have collapsed with brown skins. Retrieve them from the oven and cover them with foil to steam as they cool. Allow the other roasted vegetables to cool as well. Turn the oven down to 160°C. Thinly slice the onions. Saute them with the bay leaves in 2 tablespoons of olive oil in a frying pan over low heat. Stir them regularly, cooking until they're caramelised, around 25 minutes. Turn off the heat and discard the bay leaves. Remove the foil from the capsicum dish and peel off their skins. Dice the roasted capsicums. Spread the caramelised onions over the pie crust. Spoon in all of the roasted eggplant, sweet potato, zucchini and capsicums. Dice the ricotta and feta and arrange these over the roasted vegetables. Whisk together the eggs and cream with some salt and pepper, and gently pour them into the tart. Halve the cherry tomatoes and arrange them cut-side-up over the tart. Bake the tart for up 35-45 minutes, until golden and set. All it to rest for at least 10 minutes before serving. Our semi-regular Ottolenghi cooking crew took advantage of one of the last glorious summer evenings of the season to head to Princes Park for a picnic potluck. I decided to avoid the big sharable salad-style dishes I usually fall back on and went scoping for snackier options, settling on two dip-based dishes that looked relatively easy to throw together. First up: polenta crisps an avocado and yoghurt dip. This was not as easy as I originally assumed - the dip was super simple, but the polenta crisp making required a lot of challenging shallow-frying. It all worked out okay in the end, but this is a recipe that you need to devote a bit of time and effort to. The pay-off is worth it in the end - my polenta chips turned out like mini schnitzels, and were an excellent vessel for gulping down big dollops of tangy avocado and lime sauce. The second recipe actually was an easy one (I won't reproduce it here - see the 2nd recipe on this page) - a simple combination of yoghurt, grated veggies, herbs, lime and butter. The melting of the butter seemed a bit unnecessary to me, and I doubt I'd bother with it next time, which would make it even simpler. It was delicious smeared across some lightly toasted Rustica sourdough. Whiz all the dipping sauce ingredients together in a food processor along with a dash of salt and pepper. Set aside. Bring the stock to the boil in a medium sized saucepan. Slowly pour in the polenta and cook over high heat for about five minutes, stirring as much as you can to keep things smooth. Once the mixture is nice and thick and the liquid absorbed, stir through the chives and parmesan for about 30 seconds and then kill the heat. Pour the polenta out onto flat surfaces - we used two large baking trays lined with baking paper, but chopping boards would work fine as well. Ottolenghi wants you to spread the polenta out so it's nice and thin - maybe 2-3mm. I used the back of a spoon and maybe didn't quite get things as thin as that - it's a tricky balance between getting crisp little chips and having chunks that will hold together. Leave the polenta to set for half an hour or so and then break it up in to pieces about 5cm x 5cm - it won't break super evenly and it doesn't really matter if some are much larger and some much smaller. Dip each piece in the semolina and set them aside for frying. Heat enough oil in a frying pan so that you've got a depth of about 1cm. When it's nice and hot, fry the polenta pieces in batches, for about 2-3 minutes on each side until they go golden brown and get a little crispy around the edges. Transfer the cooked chips to a plate lined with paper towel and keep on frying, topping up the oil as necessary. Serve, with the dipping sauce at the ready.